Contributors. Acknowledgements. Preface. Design and Modeling Techniques. Recent advances in mathematical programming for cell formation (C.-H. Chu). An industrial application of network-flow models in cellular manufacturing planning (A. Garcia-Diaz, H. Lee). Design quality: the untapped potential of group technology (C.T. Mosier, F. Mahmoodi). Partitioning techniques for cellular manufacturing (S.E. Moussa, M.S. Kamel). Manufacturing cell loading rules and algorithms for connected cells (G.A. Suer et al.). Cellular manufacturing design: a holistic approach (L.L. Massay, C.O. Benjamin, Y. Omurtag). Performance Measure and Analysis. Measuring cellular manufacturing performance (D.F. Rogers, S.M. Shafer). Performance of manufacturing cells for group technology: A parametric analysis (A. Agarwal, F. Huq, J. Saris). Design of a manufacturing cell in consideration of multiple objective performance measures (T. Park, H. Lee). Machine sharing in cellular manufacturing systems (S. Benjaafar). Integration of flow analysis results with a cross clustering method (M. Barth, R. De Guio). Artifical Intelligence and Computer Tools. Adaptive clustering algorithm for group technology: An application of the fuzzy ART neural network (S. Kamal). Intelligent cost estimation of die castings through application of group technology (R. Veeramani). Production flow analysis using STORM (S.A. Irani, R. Ramakrishnan). A simulation approach for cellular manufacturing system design and analysis (A.K. Kamrani, H.R. Parsaei, H.R. Leep). Subject Index. Leading researchers in the field of cellular manufacturing systems from academia and industry have contributed to this volume. The book aims to report the latest developments and address the central issues in the design and implementation of cellular manufacturing systems. Cellular Manufacturing (CM) is one of the major concepts used in the design of flexible manufacturing systems. CM, also known as group production or family programming, can be described as a manufacturing technique that produces families of parts within a single line or cell of machines. 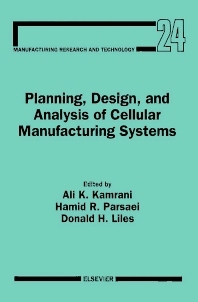 The first part of the book describes various techniques for design and modeling of cellular manufacturing systems. The second part is concerned with performance measure and analysis, followed by a section which presents the applications of artifical intelligence and computer tools in cellular manufacturing systems.